Following the Italian invasion of Abyssinia in early October 1935, the League of Nations Council agreed on 7 October that Italy had broken Articles 12 and 16 of the League Covenant by resorting to war and committing an act of aggression. Three days later its member states voted overwhelmingly in favour of the imposition of economic sanctions against Italy to quell Mussolini’s belligerence. Some observers alleged that the League’s most powerful supporter, the United Kingdon, was acting selfishly to protect her economic interests in east Africa. After all, Lake Tsana in northwestern Abyssinia fed the Blue Nile which irrigated British cotton plantations in Egypt and Sudan. Nevertheless, Éamon de Valera, as both the Irish Free State’s President of the Executive Council and Minister of External Affairs, supported the sanctions completely on the principle that ‘If we refuse to fulfil these obligations we can only be held as having violated the Covenant and our international contracts’. The Irish Times unequivocally supported his stand in Geneva, broadly declaring that the people of the Free State, without distinction of party or class, have welcomed [de Valera’s] attitude in regard to the Italo-Ethiopian dispute, and have admired the qualities of statesmanship which he has displayed in dealing with the affairs of other nations. On 7 November 1935 Dáil Éireann almost unanimously passed the League of Nations (Obligations of Membership) Bill which provided the legal machinery for sanctions. Two years earlier, in 1933, three organisations—Cumann na nGaedheal, the Centre Party and the National Guard, which was under the control of the ex-Garda Síochána Commissioner General Eoin O’Duffy—had amalgamated to form a new party called Fine Gael as part of a ‘major realignment among the opposition forces’ in the bitterly divided politics of the Irish Free State. O’Duffy, who had been dismissed as chief of the police force in February 1933 by de Valera, was elected as president of the new political party but W.T. Cosgrave remained as its leader in the Dáil. This arrangement was short-lived, however, and O’Duffy was forced to resign from the party in September 1934 due to his ‘violent rhetoric and unconventional leadership’. Following this dramatic departure from Fine Gael, O’Duffy claimed to retain his position as head of the semi-autonomous League of Youth, also known as the Blueshirts (formerly the National Guard). His assertion of leadership was, however, bitterly contested by ex-Commandant Ned Cronin and the organisation split in two with most activists supporting Cronin, some following O’Duffy and many others deciding to leave the movement rather than choose sides. It was around this time that O’Duffy also began to become more involved in international fascism—he attended the German Nazi-sponsored International Action of Nationalisms conference in Zurich in December 1934. O’Duffy was a supporter of fascism’s corporate state ideal which was popularised by the papal encyclical Quadragesimo Anno and sought to find social harmony amongst the various classes in society through the establishment of corporations that represented workers and their employers. They rejected both laissez-faire capitalism and totalitarian communism, believing in a balance of the two. O’Duffy’s support of corporatism (also known as vocationalism) went far beyond lip-service and he even convinced Fine Gael to adopt it as their economic policy in 1934. That said, O’Duffy’s ideology could not be called fully fascist. In his famous work The Blueshirts, Maurice Manning points out that the organisation ‘had much of the appearance but little enough of the substance of Fascism’. Whatever may be said about the depth or purity of O’Duffy’s adherence to fascism, there can be no doubt of his heavy involvement in its international network during the period under review. After founding the National Corporate Party in June 1935 (an organisation which a Garda Síochána report described as ‘a huge farce—there would appear to be little to fear from this movement’), O’Duffy attended the Italian-sponsored Comitati d’azione per l’Universalita di Roma convention at Montreaux, Switzerland in September that year where he was appointed to the secretariat of the Fascist International. It was at that same conference that O’Duffy made first mention of his infamous dedication of 1,000 Blueshirts to fight for Mussolini in Abyssinia. The issue of Irishmen joining Mussolini’s crusade had first appeared in the Irish Times two weeks earlier in an article that claimed that second-generation Italians living in Ireland were being recruited in Dublin although the Royal Italian Consul General, Commendatore Lodi Fé, was unavailable to confirm or deny the charges. According to contemporary legislation, recruitment by a foreign power in a neutral country like the Irish Free State was not illegal so long as the foreign power was not at war. Domenica del Corriere, weekend supplement of the Italian newspaper Corriere della Sera depicting Italian Blackshirts in action Ethiopian forces, January 1936. However, upon the outbreak of hostilities, the Irish Times reported, ‘recruitment may become an offence retrospectively. For a neutral power to recruit for one or other belligerent would be regarded as a breach of neutrality.’ Britain already had prohibitive legislation in place through the Ethiopia Order in Council, 1934 which forbade Britons from taking part in hostilities against Ethiopia or ‘abetting revolt against the government of that country’. There was no mention in the Irish Times newspaper article of the Blueshirts or Eoin O’Duffy. General O’Duffy, head of the Irish National Corporative Party, announced that a thousand Irish Blue Shirts have already requested the honour of being employed in East Africa alongside Italian troops, because they are aware that the Italian war against Ethiopia represents the struggle of civilisation against barbarianism with which all the hidden forces of retrograde materialism and anti-Fascism are today allied. Without a transcript of O’Duffy’s speech at Montreaux one can only guess as to whether or not the reasons that he gave for Blueshirt enthusiasm were accurately reflected in the Il Messagero article. It is not hard to imagine O’Duffy standing in front of fascist leaders from all over the world, including Mussolini himself, and supporting a struggle against ‘barbarianism’ and ‘retrograde materialism’. Nor is it difficult to imagine him pledging Irish soldiers for ‘the Italian war against Ethiopia’ although it is noteworthy that this contradicts a statement O’Duffy made on the subject when he returned to Ireland on 18 September. In an interview with the Irish Press O’Duffy said that the Blueshirts were volunteering to fight ‘not for Italy or against Abyssinia, but for the principle of the corporate system’ against which ‘the forces of both Marxism and of capitalism’ were ranged. There was widespread and sometimes virulent condemnation amongst O’Duffy’s domestic enemies of his pledge of volunteers for Mussolini’s army. Clearly, many in the country at large did not take his words too seriously as they did not elicit much response in political circles or the press in general. But the Irish socialist-republican organ Republican Congress vehemently attacked the general. Referring to his ‘promise of 1,000 mercenaries for Mussolini’s forces’, the Congress claimed that ‘after fifteen years in the political limelight O’Duffy has played his last card. In turn Irish Republican, Imperialist Chief Thug and again professing Republican, he is now a hireling of Mussolini’ (O’Duffy had started courting Irish republicans in May 1935, presumably to strengthen his flagging Blueshirt faction). At a meeting of communists in September 1935, Sean Murray warned that ‘the dockers of Dublin would have something to say if it came to transporting O’Duffy’s Blueshirts to Abyssinia’. Opponents within the fractured Blueshirt movement railed against O’Duffy’s deepening involvement in the international fascist movement and claimed that the general should focus his energies at home ‘where all his organising abilities may be necessary to keep his organisation alive’. One of the contradictions that may seem obvious in retrospect to today’s observer was the issue of an Irishman like O’Duffy (who had actively fought against British imperialism in Ireland) supporting Mussolini’s ostensibly colonial adventure in Abyssinia. This paradox was largely ignored at the time although it was raised in a letter to the editor of the Irish Independent. On 24 September 1935 John Kealy lamented that ‘a man [O’Duffy] who had taken such a great part in Ireland’s fight for freedom should now support Italy’s policy of conquest and oppression of another peaceful people.’ After noting that O’Duffy disputed any parallel between the Italo-Abyssinian conflict and the Anglo-Irish struggle on the grounds that the object of the latter had been to ‘wipe out a civilised people’, Kealy claimed that ‘the obvious inference is that the general believes that because the Abyssinians may not be civilised it is an honourable and desirable mission to wipe out them’. In 1914 we were called upon to do our bit for poor little Belgium to make the world safe for democracy, and Asquith said Ireland was the one bright spot. We know what followed. To-day we are called upon to do our bit for poor little Abyssinia to make the world safe for hypocrisy, and Baldwin says Ireland is again the one bright spot. Will history repeat itself? I have done no such thing. Before I went to [Montreaux] I got applications from Blueshirts and others in different parts of the country for forms to fill in and to know if they would be able to enrol for service with Italy. I simply acknowledged these applications. Benito Mussolini-it is doubtful if he ever considered O’Duffy’s request very seriously. In the end no Blueshirts went to Abyssinia. The proposal was rejected because, as O’Duffy stated, ‘I do not think that Italy requires our physical support, but she would undoubtedly appreciate our moral support’. It is highly doubtful that, considering the sanctions and general atmosphere of dissatisfaction with Mussolini’s belligerence that pervaded Ireland at the time, O’Duffy could have effectively raised a volunteer force and got it over to east Africa. Unlike the swelling tide of anti-communist fear that enabled him to organise a brigade to support Franco during the Spanish Civil War one year later, there was almost no popular support whatsoever in the Irish Free State for the idea of fighting against Abyssinia. It would appear that O’Duffy’s motives in proposing to lead a brigade to Abyssinia were based strictly on his commitment to international fascism. His other favourite self-images of Christian crusader and anti-communist simply did not apply to Abyssinia—the country’s emperor, Haile Selaisse, after all, was neither burning churches nor espousing socialism. In fact, Abyssinians were mostly adherents of the Coptic Church although their religion did retain trace elements of older faiths. Considering the massive military superiority that Italy enjoyed over Abyssinia it is also doubtful that Mussolini ever considered O’Duffy’s request very seriously. Furthermore, the Duce had enough logistical problems at his Eritrean port of Massawa as things stood without having a few hundred disorganised Irishmen added to the mess. A 17 September 1935 Irish Times article pointed out that ‘the harbour organisation [in Massawa] is strained to breaking point’. 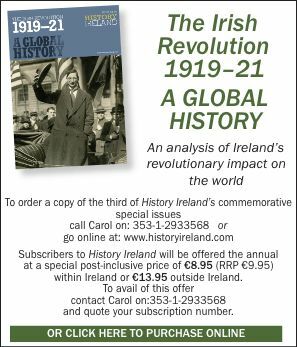 Despite O’Duffy’s bombast, the fact remains that he and his Blueshirt supporters had very little effect on the Irish Free State’s involvement in the Abyssinian crisis. Cian McMahon is a postgraduate student in modern Irish history at University College Dublin. M. Kennedy, Ireland and the League of Nations (Dublin 1996). D. Keogh, Ireland and Europe, 1919-48 (Dublin 1988). M. Manning, The Blueshirts (Dublin 1971).